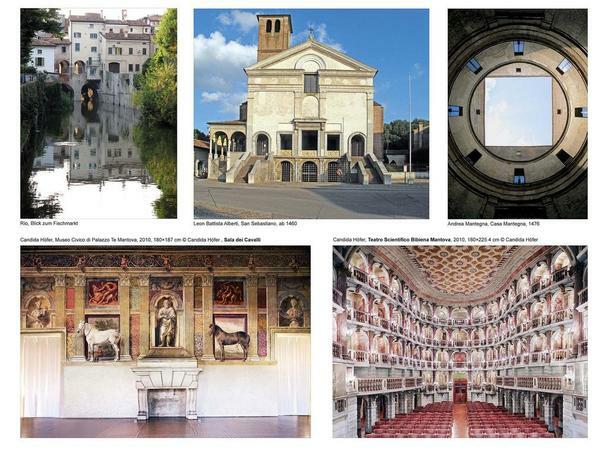 Part of the wealth of Mantua’s (Lombardy, Italy) art treasures is the Palazzo del Te. Once like an island composed as Villa Suburbana today the palace is placed in an inscrutable mixture of the urban outskirts. This pleasure palace is a famous masterpiece of mannerism by the architect Giulio Romano, finished 1534. During a local workshop we developed our concepts in discussion with the town planning administration and colleagues from the Polo Territoriale di Mantova of the Politecnico Di Milano - Scuola Di Architettura E Societa‘. The semester projects derived from this we present in this common presentation from the urban scale 1:1.000 to its architecture in the scale 1:100. This project results from a collaboration of Prof. Fabio Ceci (Politecnico Di Milano), Prof. Klaus Schäfer (SoAB) and by the proposal from Giulia Moraschi (Dirigente Settore Ambiente, Comune di Mantova). We would like to thank the landscape architect Christina Kautz (Berlin) for the kindly support of our project also. Zur an Kunstschätzen reichen italienischen Stadt Mantua, Lombardei gehört der Palazzo del Te. Einst auf einer Insel als „Villa Suburbana“ entworfen, liegt der Palast heute in einem undurchschaubaren Gemenge städtischer Randlagen. Das Lustschloss gilt als ein Meiserwerk des Manierismus des Architekten Gulio Romano vollendet 1534. 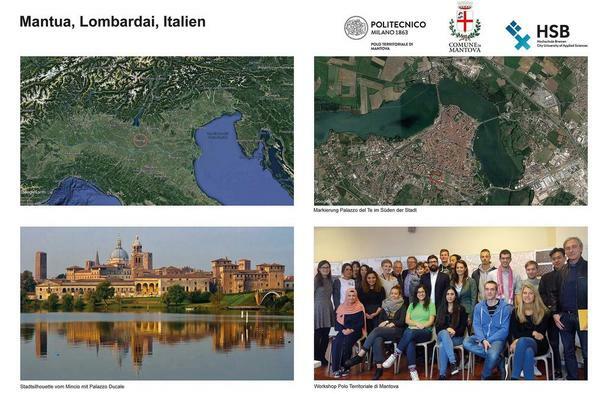 In einem Workshop vor Ort haben wir mit Vertretern des Stadtplanungsamtes und dem Polo Territoriale di Mantova der Politecnico Di Milano - Scuola Di Architettura E Societa‘ Konzepte für unsere Entwürfe erarbeitet und diskutiert. Die hieraus entstandenen Semesterentwürfe vom städtebaulichen Maßstab 1:1.000 bis zur Architektur im Maßstab 1:100 präsentieren wir hier in einer gemeinsamen Präsentation. Das Projekt entstand aus einer Zusammenarbeit von Prof. Fabio Ceci (Politecnico Di Milano), Prof. Klaus Schäfer und auf Anregung von Giulia Moraschi (Dirigente Settore Ambiente, Comune di Mantova). Der Landschaftsarchitektin Christina Kautz, Berlin haben wir ebenfalls für die freundliche Unterstützung unseres Projekts zu danken. The environment of the Palazzo del Te has to get a conversion which has to take shape but shouldn’t create new attractions. The main view point is the Palazzo, nonetheless the enclosure should have an urban weight. The urban strip between Viale Risorgimento and Viale Isonzo is the principal threshold to the city although the southern setting hasn’t to be ignored and the railway could be transformed without destruction of an important infrastructure of Mantua. Contrary this could be the place of a new stop named Palazzo del Te. Many projects argue for the increasing of the railway along the Palazzo. That means to double the existing line for each direction and to elevate the system partly on pillars. Herewith a grade-separated traffic between railway and Strada Statale 62 will be possible. One motive was also to suspend the barrier to the southern area of Mantua and to give more space to the Palazzo.